The American Hotel, 49 Main St. Sag Harbor, NY 🍽 ☆☆☆☆ $35/p. ––– 3 Course prix fixe: wine/ dessert/coffee/tea/tax/tip. We now focus the efforts of Lions and Leos on five service areas with the goal of tripling our humanitarian impact by serving 200 million people a year by 2021. The Global Service Framework complements all of the great ways clubs serves locally and gives Lions new opportunities to help meet the growing challenges facing humanity. The Sag Harbor Lions Club Charitable Trust was established in 1972 as a 501(C)(3) Charitable Organization. Your charitable donation may be deducted to the full extent of the law. The Guide Dog Foundation's mission is to improve the quality of life for people who are blind, visually impaired, or with other special needs. A guide or assistance dog brings a newfound sense of independence and dignity to someone with disabilities. 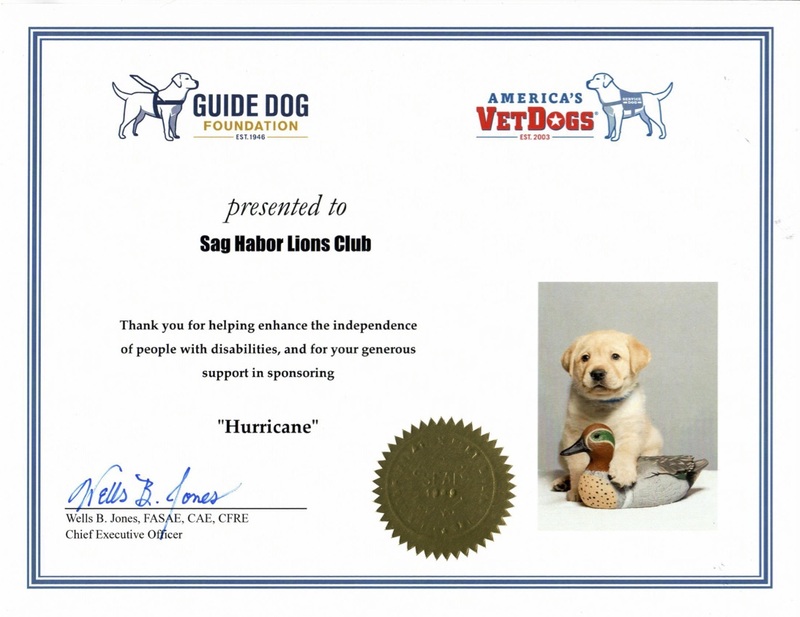 The Guide Dog Foundation for the Blind, Inc.® would not be able to provide guide and assistance dogs at no cost to their consumers without financial support from individuals and clubs like ours. This was the first year of Andy's Run 5K and the first year of the Sag Harbor Lions Club donation of $6,000.00. We don't have a picture of the dog from that year. 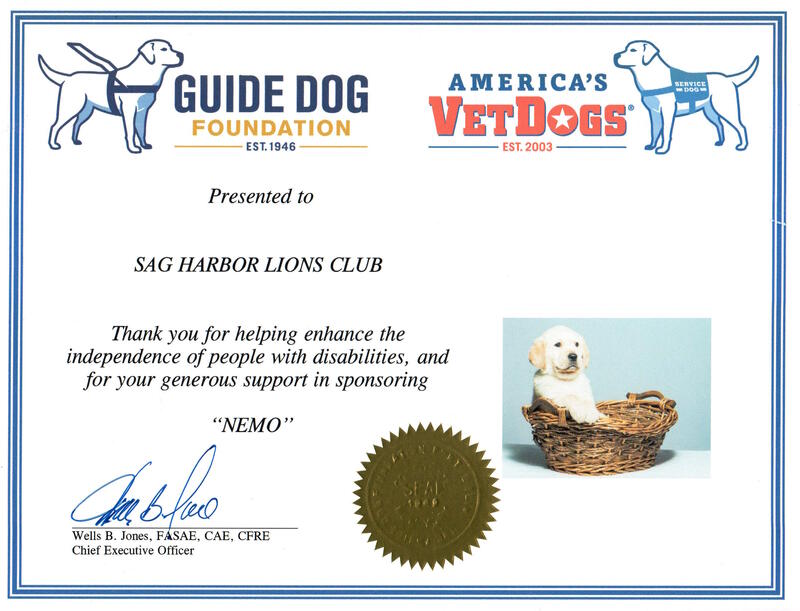 After the premiere of Andy's Run in October 2013, Sag Harbor Lions Club donated $6,000.00 from the net profits to sponsor a guide dog named Nemo. He is a golden lab. He was placed with a visually impaired person in 2016. After the 2015 Andy's Run, we donated another $6,000.00 to sponsor Saige. 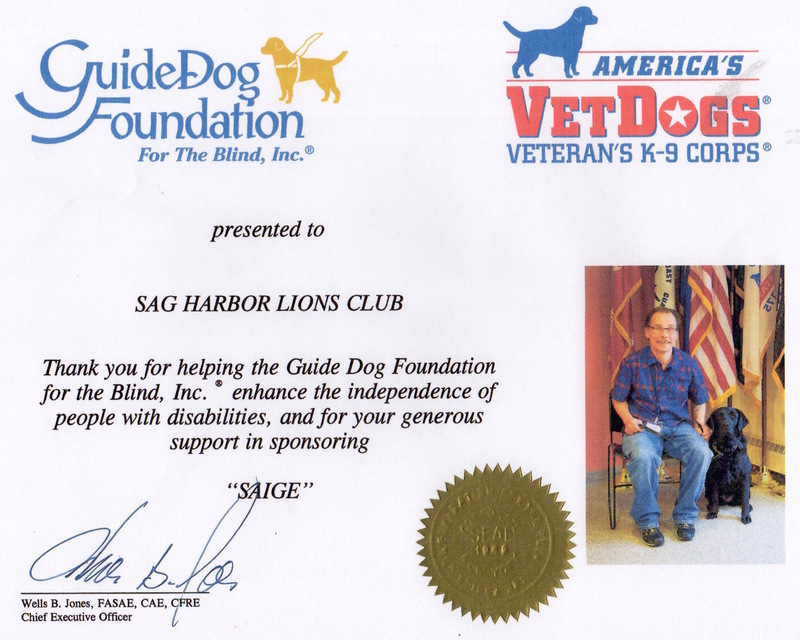 Saige is one of America's VetDog®, Veteran's K-9 Corp®. These dogs are trained as Guide Dogs, but sometimes a dog doesn't graduate as a full guide dog. In these cases, the dogs are presented to American veterans who need some assistance. 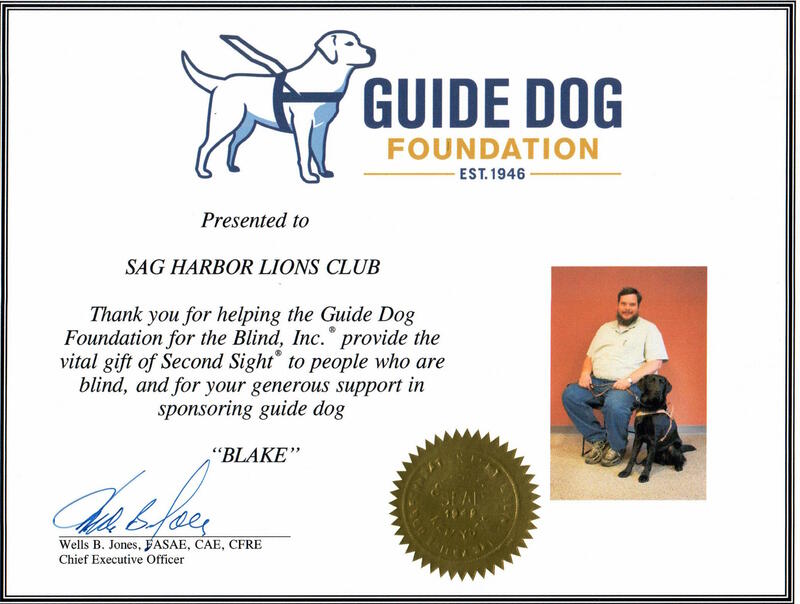 Following the 2016 Andy's Run, we donated the same amount again but for a full guide dog named Blake. He was placed with Thomas Jones in Tennessee. This is where our gifts start locally and can end up helping our neighbors locally or friends in need nationally. We raise enough money form Andy's Run on Sep. 9, 2017, and a reception for the Guide Dog Foundation held on Dec. 9, 2017, to be able to fund our guide dog sponsorship in 2017. Don't you want to just give that punim a kiss? Each year our club offers graduating seniors an opportunity to apply for and win one of three Lions Scholarships to be used towards college expenses. There is no restriction on the use of the scholarship awards. 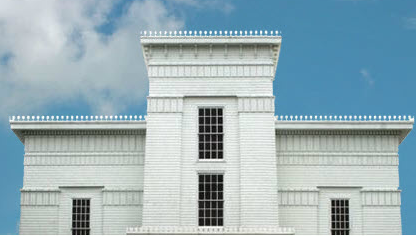 Initially, the estate of Lion William Schmidt, a local electrician, donated an amount of money as the principle for the club to present a scholarship in his name in perpetuity. In the past decade, low interests rates earned minimal interest; the club has been unable to utilize the interest earned to present a scholarship award. To offer an award, the club went to work and held fundraisers to make up the difference. Today our club apportions money from our other fundraisers to finance the scholarships. Our Club presents three awards each year depending on the number and characteristics of the applications received. The qualifications for the scholarships is a combination of four essential elements: community service; academic standing; intramural activities; and possible financial need. The three awards presented are one first scholarship of $2,500.00 and two secondary scholar-ships of $1,500.00 each. The scholarships are awarded through an application process. Applications are available in mid-April from the Guidance Office at each school. A distinguished panel of Sag Harbor Lions reviews each application. All applicants are informed of the results privately, then announced after Memorial Day. The Committee Chair, Lion Mark Poitras presents the award winners with their checks and certificates at the July Membership Dinner Meeting with two parents or family members in attendance. All are guests of the club for this dinner at the Amerian Hotel. The announcement of the scholarship winners will appear in the local media and on our Special Acknowledgement page after Memorial Day. 1 and 2: depending on: funds raised throughout the fiscal year to meet the awards; the number of applications received; the qualities received in fulfilling the parameters of the applications. Sag Harbor Community Food Pantry, Inc.
A portion of the money we raise at the St. Patricks Day Corned Beef and Cabbage Dinner and the Christmas Tree Sale goes to the Sag Harbor Community Food Pantry. Housed within the Old Whaler's Church, this organization's goal is to lovingly provide basic provisions to their neighbors in need. We also support the Old Whaler's Church for the use of the kitchen and dining hall for the St.Patrick's dinner and the use of folding tables and chairs for other events. in 1986 as a not-for-profit organization dedicated to fighting corneal blindness. As part of the North Shore-LIJ Health System, the Lions Eye Bank coordinates all of the activities necessary to recover, process, medically screen, and distribute donated eye tissue for transplantation, research, education, and the advancement of medical technique. The Lions Eye Bank for Long Island is registered with the FDA, licensed by the New York State Department of Health, and fully accredited by the Eye Bank Association of America (EBAA). We collect used and discarded eyeglass and send them to Lions Clubs International, who has a volunteer team that determines the prescription, cleans and distributes them to those who need eyeglasses and cannot afford them. If you wish to donate prescription lenses, they should be left in the frames when you donate them. Lions volunteers at sight centers use an optical machine that determines the prescription of the lenses. You can drop off your used frames and lenses at Yardley and Pino Funeral Home in Sag Harbor. 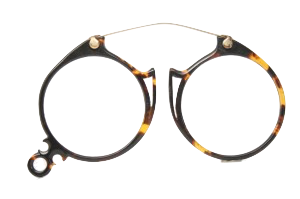 If you have had a family member that recently passed away, please let your funeral director know that you'd like to donate the departed's eyeglasses to Lions Clubs before the casket is closed. More about donating or receiving Lions eyeglasses. The Sag Harbor Lions can assist individuals or families who are unable to pay for needed eye exams, frames and lenses, mobility hardware and individual assistance on an array of needs. If you are in need of assistance to pay for your vision health services, your corrective eyewear or assistance with a service dog care please let us know. You may receive a grant from the club to pay for all or a part of your services. Write us by email or a letter. In your correspondence, express the need for your vision health service assistance. Provide some background information about yourself, your vision condition and why you need financial assistance to pay for your services. Include the best way to contact you. Our Club Directors meet on the second Tuesday of each month. Please send your letter or email by the Monday preceding our meeting so your request can be introduced at the next meeting. Our meeting dates are published in our Calendar page - the second Tuesday of each month. Once your letter is received by our secretary, the letter will be introduced at the next meeting. If we have questions about your request, someone on the Board will contact you to clarify. After that, the Sag Harbor Lions Club will get back to you with our decision. If we choose to grant your request we might ask you to go to the WalMart Vision Center in Riverhead so that we can provide you with quality care and save money. This allows us to honor as many requests as possible. 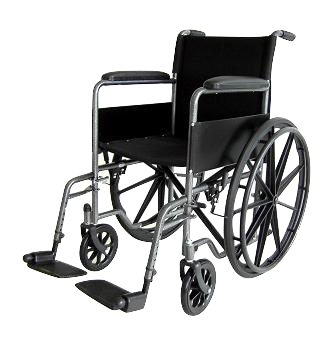 We have home healthcare equipment such as wheelchairs, walkers, crutches, canes, and commodes for those who need them for any reason. Email us or call Yardley & Pino Funeral Home (631) 725-0251. Deering and Ken Yardley warehouse these items in the back of their business. The wheelchairs we have may not resemble the image to the right. We also accept donations from those who have used equipment that is in good working conditions. I just donated to the Lions Club because I was in a pinch, needing a commode for my aged mother who is coming for a visit and needs a commode. Hamptons Health Care recommended that I call Ken Yardley (Yardley-Pino), ... and he explained that such items are made available through the kindness of the Sag Harbor Lions Club. I want to thank and commend you for such a wonderful community service along with my donation. In the past, we've helped those who couldn't pay for their fuel oil when those prices spiked and we've assisted families in our community who were unable to pay for their groceries while facing foreclosure on their home. Contact us at the above email or landline. The Sag Harbor Youth Committee is dedicated to publicizing, facilitating and planning constructive and enlightening activities to engage, entertain and educate youth in Sag Harbor.